What is the Seattle Bike Justice Project? The Seattle Bike Justice Project came out of my ongoing interest in considering the problem of different communities having different images of bicycling. I’ve been doing bike research and bike advocacy since 2008. I’m an anthropology student doing my dissertation about the bike movement in Los Angeles. My research was basically being involved in activist projects and advocacy. One of the things I’d been doing in LA was outreach with day laborer cyclists. There were a lot of people using bikes down there because it’s the cheapest way to get around. Some collaborators and I were interested in connecting the interests of that population with the bike movement. There’s an organized bike movement; bike advocates who were going to city hall and lobbying. But they were not necessarily representing the concerns of this other group of bicycle people. I came to Seattle to write my dissertation and get a little distance from LA. When I moved up here I thought I was going to be able to continue that kind of work. But I realized that this is a very different city. There isn’t that same large population of people using bikes just because it’s the cheapest way to get around. Partially because there are a lot of other impediments here like the hills and the rain that make bicycling not as approachable, as it was in LA. Ironically, because people don’t think of LA as a bike city. I started volunteering at Bike Works down in Columbia City and it was drawing me more and more to South Seattle. I started thinking about the tensions between Rainier Valley and the rest of the city. I could see quite a contrast between Columbia City and further south like Rainier Beach and the kind of different public spaces that people are creating. They’re so close together, but they can be really far apart in terms of safety, in terms of what’s there to draw people to the streets. I decided maybe I could do this ethnography thing that I know how to do and help out somehow with this issue in Seattle. There’s obviously a really strong bike movement in Seattle, a lot of support for bicycling in the city. But there’s a pretty clear divide between people who think bicycling is a good idea and people who don’t think bicycling is a good idea. Lots of people think bicycling is bad for different reasons, but here it seems like that perception also corresponded to some kind of older racial tensions and issues of who lived where and what kind of areas are bike friendly versus what areas are more high traffic and that kind of thing. And that’s where the low-income housing is. I got support for the Seattle Bike Justice Project from Bike Works and the Bicycle Alliance of Washington. I interviewed leaders at different organizations. Man on the street interviews are interesting in their own way, but I wanted to hear from people who occupied a position of respect in the community. I interviewed executive directors of organizations and people who worked at nonprofits. It was really interesting. I only did nine interviews; it was a really small-scale project. But I got to talk to people in the east African community, African American, Mexican American, and Filipino American. I got a kind of crosscut of different views on bicycling from these different activists. Overall, the thing I got out of it was people have very nuanced views about bicycling. People can totally articulate why bicycling is good. They know it’s good for the environment, it’s got health benefits. But that doesn’t necessarily mean they’re going to see it as something for them or their community. The project became about just documenting that some people have images about bicycling that are not positive. Or some people have images of bicycling that connect with a certain childhood experience. Or a certain population they imagine will use bicycles. I’ve realized that if I’m really concerned about bringing social justice into bicycling, we need to consider other issues of urban development. The cost of housing, infrastructure, how bike projects and other pro-public space elements impact these things. Because in the U.S., there’s an image that bicycling is about gentrification, an image that developing bicycling is about getting existing community members out of a neighborhood. Personally I really don’t see bicycling as being about those things. So it’s really important for me to figure out how to build better images of bicycling that take people’s concerns into account, because people have valid concerns about this issue. But if we just throw the baby out with the bathwater, so to speak, we’re missing out on a lot. Bicycling really does have a lot of positive impacts for urban communities. Clearly equity is an important part of your project and your work. What does it mean to have equity in the bicycling community? I’m coming from a perspective of doing community-based, participatory research and the core idea of that is that as a researcher you don’t come into a place with an idea in mind of what you’re going to do, then use research to support that idea. It’s about building research projects through participation with people in order to be able to address their concerns. So, I experienced that bicycling is a community-building tool. CicLAvia is a really great example of how people riding their bikes in the street can feel really good doing it. And they feel better about their city. It’s been really amazing hearing people say they never thought they could feel this good in LA or experience LA like this. 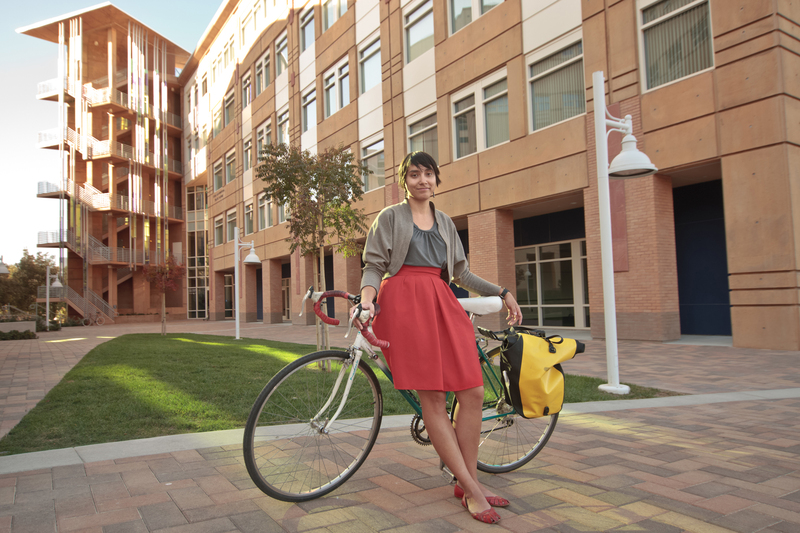 My work is to try and promote the idea of bicycling as a community-building tool. Bicycling is not just health, it’s not just recreation, it’s not just about improving some neighborhood or other. It’s about bringing together different types of people. And right now bicycling is dividing people rather than bringing them together. For me equity means taking multiple perspectives into consideration and working with a coalition of people to define what bicycling is going to mean for America. Based on your experience with your project, how would you say Seattle could do better creating a better bicycling community, or create more diversity in its bicycling community? Based on what I’ve seen, I feel like the Rainier Valley Greenways project is a good example of good work in that direction. At first I thought it seems kind of great for communities that already have committed bicyclists who know about routes and can make recommendations. But what about communities or neighborhoods who don’t have a bunch of people who are already empowered in that way? How are they going to provide that great feedback and recommendations to the city? But from what I’ve witnessed of their organizing they’ve been trying to work from within the community and use existing resources. They didn’t just come in and say “hey now we’re bringing in this project from the north part of the city and this is how it’s going to be done.” They’re a good example of cool work being done that’s more inclusive. Yes. I’ve done a lot of traveling and talked to bike advocates in different cities. And I’ve seen that when people get into biking they really get into it and think it’s really great. And they don’t necessarily understand why other people don’t like it. Or they’re not taking the time to grasp that other people might not like it. And, a lot of the people who’ve gotten into bike advocacy tend to be more empowered people in our culture. People who have more privilege because of race and class and education and things like that. I think that that has had an effect where unintentionally, without any ill intent, it has created an idea that it’s empowered people who rides bikes. Those empower people always get what they want from the city and now they want bike infrastructure, so of course they’re going to get it. And who’s going to pay the cost? The communities who aren’t even using bikes. I don’t really think that the bike advocacy community has done the footwork of showing why bicycling is for everyone. There’s just kind of this assumed goodness about it. And I’m one of those people, I think bicycling is really awesome and sometimes I have to stop and think, why do I think biking is so great? It would be super awesome if we could figure out ways to connect with existing, positive projects in different communities. A lot of struggling neighborhoods have existing community-based organizations. Churches, nonprofits of different sorts, all kinds of immigrant support groups that are already trying to improve life for people. We have an opportunity to talk to the people running those organizations and say “hey we want to improve life for people too.” Find out what they think about what bike advocates are trying to do and have a conversation about the reasons we think bicycling is so good for people. Unfortunately, conversations like that aren’t easy to make happen. That’s my ideal, figuring out ways to facilitate that meeting of the mind between bike advocates and other community organizations doing good work. Photo courtesy of Anne-Marije Rook. More on the personal side of things, how did you get into bike advocacy originally? I went to college in Portland, OR. I had a bike that I rode on campus. But I didn’t ride it off campus. It didn’t occur to me that I could ride it around the city. Then, after I graduated, my boyfriend at the time was like “I’ve been riding a bike, you really need to get a bike, it’s the cool thing to do.” So I got one. I really hated it at first. I thought it was really scary. But then it became awesome. I felt super empowered and riding felt really, really good. Tension with other road users aside, biking for me was really good. I left Portland in 2007 to go to grad school in southern California. We moved from Portland to Long Beach. It’s a very similar size to Portland and has a similar gridded layout, lots of old apartment buildings downtown, lightrail. All these things that made it seem like we could have a similar lifestyle. At that point I didn’t think about bicycling as a political act. It was just how I got to work. I didn’t always ride. I sometimes drove. But that all changed when I moved to Long Beach. I was getting harassed by motorists. It was really scary. I realized people really don’t want me to be here. It made me think about bicycling a lot more and think about people’s attitudes towards transportation and the streets. I had originally planned to do a different project for grad school, but two really important things happened that made bicycling take hold. I grew up in Southern California in a very suburban place called San Juan Capistrano. In October 2007, there was a guy biking home late at night from his job as a dishwasher at a Denny’s. He worked on this curvy, high-speed suburban road and was biking home on the sidewalk. A woman was driving drunk, lost control of the car, and hit and killed him. When I read about that, it just made me realize that while I am challenged riding my bike, other people are much more vulnerable than I am. I started thinking about how I grew up with this. All these distinctions about transportation and how the second I was able to stop riding the bus, I did. And I never rode a bike growing up. There’s a lot going on with how we chose to get around. So that was one thing that really brought race and class to my mind around bicycling. The second thing was going to a city hearing. Long Beach now is all about being a great bike city and having great bike stuff, but this was right before they started that big push. I got to go to a city hearing where they were talking about putting in a bike boulevard in the neighborhood I lived in. There were all these low traffic neighborhood streets so it totally made sense to put up some signage and some bollards and make it a bike route. My boyfriend and I were psyched to go find out about it. These homeowners at the meeting were absolutely not OK with there being bike infrastructure in their neighborhood. They said it was going to “bring people who were going to camp out, bring in crime, drive down property values.” They were fine with people riding on their street, but they did not want it to be a designated bike route on a map. They had a perception that people who use bikes are low lives; people you don’t want around. 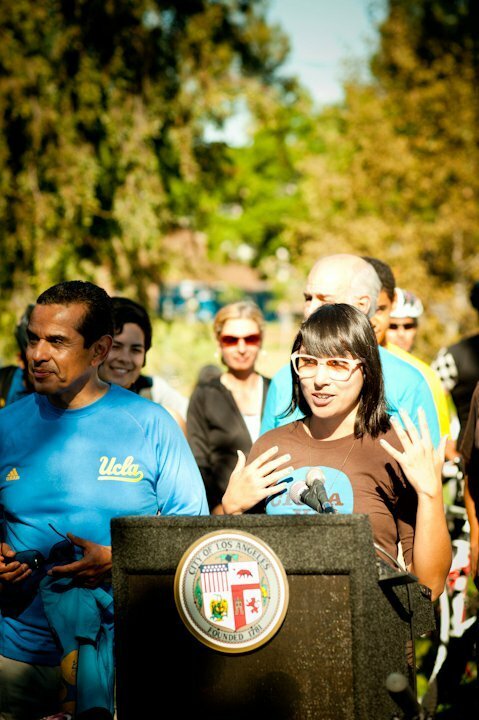 How did you get involved in getting CicLAvia off the ground? Right before we took that trip to Bogotá, we had visited this place called the LA Ecovillage, which is an intentional community in Korea Town. It’s just these two old apartment buildings that have been retrofitted as a commune. It seemed like a really good place to live if you wanted to be surrounded by car free people. In a city like LA, it really really helps to have a local community. You can feel super alienated and super disconnected from other people in the city. It’s a really, really big place, and people are driving two hours each way every day, and it’s really discombobulated. So we really wanted to move into this eco village. In order to become a member, you had to go through the membership process, which was to essentially date everyone who lived there for six months and get to know them and prove that you’re into eco stuff and you’re not just trying to get really cheap rent. When we got back from Colombia, we went to a potluck at the Ecovillage. 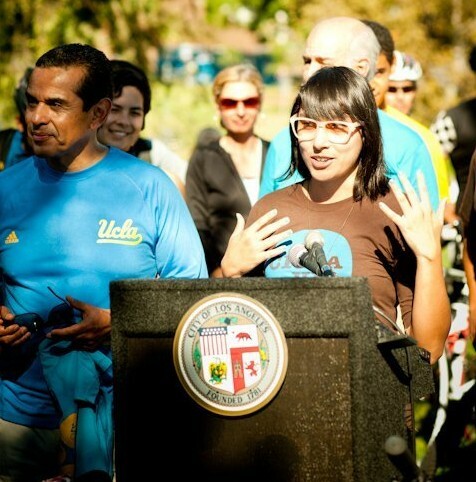 We met the founders of the LA County Bicycle Coalition because they lived there. We were telling everyone about how great the civlovia was and how exciting it had been. This woman Arisha, who worked at the Coalition suggested we go to their board meeting that was happening in three days. We went and found out they were starting a ciclovia committee and we joined. We had a core group of six or eight people who were meeting monthly. It was just really fun. I’d never done committee work like that before, so I didn’t know what I was doing. But I became secretary and was taking all the notes and thinking “this is good field work, too” so it had a duel role. It was a really fascinating process to be a part of. At first everyone we talked to said “yeah right, you’re never going to close a bunch of streets in LA.” And then gradually over time it became more and more real. A lot of that had to do with the fact that one of our committee members was a traffic engineer, so he was able to do really nice route studies for our proposed routes and grapple with these logistical issues so it seemed possible. We had a graphic designer on the team, so she made us a design scheme and a logo early on, so that made it look more professional. For me, it was an education in how political will gets constructed. A few of our committee members were really well connected in politics and philanthropy in LA. They knew who to talk to and had the clout to get meetings with people to pitch this idea. Things just sort of shifted. At that point we’d been meeting with his staff for several months, but we hadn’t gotten any kind of firm support. In the interview he said, “we want to do this thing where we close streets and let people come out and ride their bikes.” For us that was a coup. He was being public about the event possibly happening. It still took a year from that point for it to actually happen. It was interesting seeing the momentum build and the contingent things. The bulk of my dissertation is about being involved in CicLAvia and City of Lights. What I’m hoping to do now is look more at this question of political will and where it comes from and how people, through their social relationships and networks create the conditions of possibility for things people say are impossible. The core theoretical concept for my dissertation is human infrastructure. Bike people, we love to talk about bike infrastructure, but there’s also this human element that’s very important. 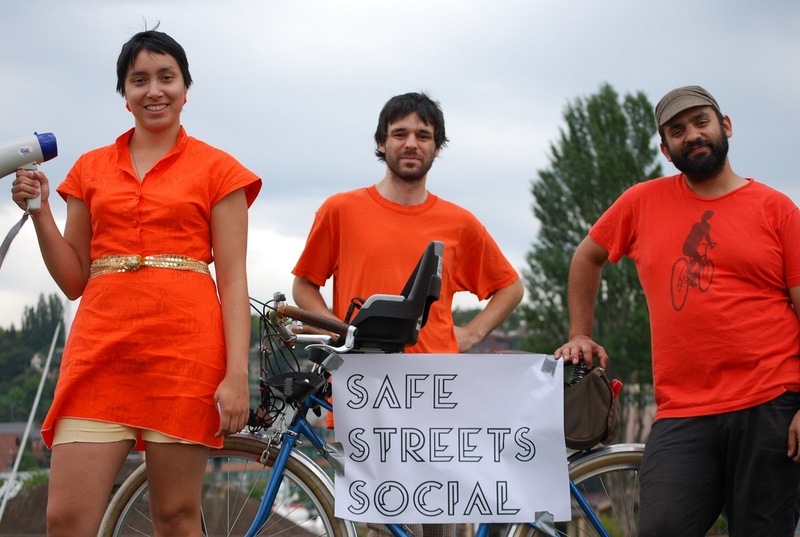 This entry was posted in Advocacy, Interviews and tagged adonia lugo, bike activism, bike advocacy, ciclavia, ciudad de luces, class issues in bike advocacy, race and bicycling, seattle bike advocacy, seattle bike justice project. Bookmark the permalink.